Can we really entrust ourselves to God and not depend on anything else? In churches throughout the world, many prepare for communion with the ancient words of the Sursum Corda, which is Latin for 'Lift up your hearts' . These beautiful words can be traced back to around the third century, but what do we actually mean when we say this? Click on image to view and/or download booklet. Syncletica was a ‘Desert Mother’, a hermit living in the desert around 3rd c. AD renowned for her wisdom. This month, we think about three of her sayings. Click on image to view and/or download. Life is busy and often gets cluttered by what is happening in our lives. Just as decluttering our homes is very helpful, so also is moving stuff aside to make space, be open and make room for the God who is present. Click on image to view/download booklet. Click on image to view and/or download leaflet. Grace is God's invitation to us to become who we are created to be, in his image and in relationship with him. Community is important for our social, mental and spiritual well-being. Often when we have to wait, our lives are put on hold and it seems as though there is nothing we can do, but God may be making us wait for a reason. Jesus calls us to be his disciples. If we wish to respond to his call, we can benefit from a pattern of spiritual discipline in our lives. It takes more energy to remain a tight bud, than it does to blossom and when we let go, God can create divine change. The bible tells us that God is love, the very essence of his Being. Exploring the Birth of the Universe and the gift of Love that was bestowed on all Creation, Sister Valmai reveals how we can be assured of God's love for us. Thresholds. Moving from one stage of life to the next. We all go through so many changes in our lifetime. Pat helps us to reflect upon these events, opening the door of our heart to what God might reveal to us in these moments. Sister Avrill considers the miraculous gift of our hands and how we receive grace and blessing through Jesus' hands. Click on image to download booklet. Sister Carol looks at biblical humility, how it differs from worldly humility, and how it fits with discernment. Sister Josephine reflects upon seeing the face of God, knowing and recognising that we are in the presence of God. Sister Pamela looks at what is 'awareness' and how we can find it. In March 2017, Rev. Judith led a Lenten Prayer Day. 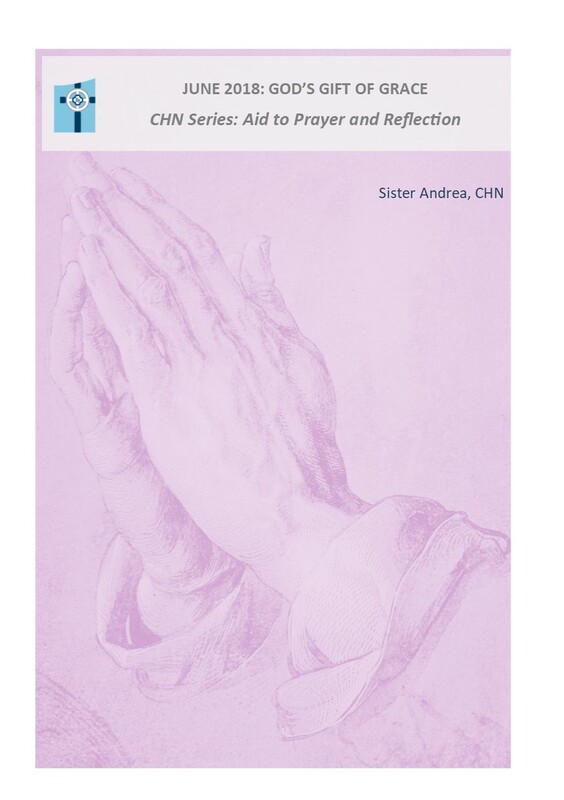 This Prayer Aid draws upon her work, to apply to the subject of fasting and praying, in general Christian life, looking at how we both give up something and take up something. In November 2016, CHN Associates, Pat Blake, looked at how we can renew our spirits even after the despair that arises through world events and closer disasters of sadness or loss. When Rev. Trish Byrne led our Prayer Day in October 2016, she explored the concept of 'sacred space' and the practice of 'breath prayer'. Last year, Sister Valmai reflected upon the image of 'Light' but where is God in the darkness? Based on the Prayer Day of September 2016.